Helen Irving is our new Professor of Biomedical Science. 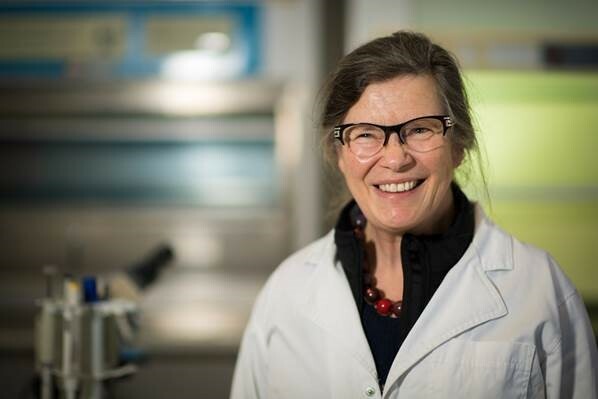 She began her career with a degree in agricultural science, but soon discovered she was “more interested in biochemistry than in telling farmers how to grow their crops.” Her fascination with cell communication has sustained her ever since. The end product: a broad research portfolio that covers everything from pH in plants to the human genome. Today, Professor Irving’s research focuses on inflammation. She speaks to Dr Giselle Roberts about the key ingredients of great discovery. When a bee stings. My research focuses on understanding the first inflammatory response. When a bee stings you on the arm, for example, it triggers an immune response. Thousands of molecules, including white blood cells, are released, and travel to the site of infection to rid your body of the venom. That is what causes redness and swelling around the sting itself. I am working with the key proteins involved in this process. One is called IRAK3. It helps to regulate the inflammatory response, so it doesn’t go into overdrive. Without it, a bee sting might cause you to have red arms, rather than localised redness. Cell communication. I am interested in how cells respond to signals. That has always been a driving force in my research. There is still so much that we don’t know, and there are more questions to be asked than you can ever imagine. Regional reinvigoration. I am based at La Trobe’s Bendigo campus. I would like to contribute to advancing the research that is happening here. Science communication is part of that, ensuring staff go to conferences and develop networks beyond the narrow professional circles we often find ourselves in. I would like to be involved in adding to research impact in the region, and mentoring the scientists here. Bendigo is a great city, and offers a wide range of opportunities for researchers. We need to be inclusive and flexible in order to get the most out of those opportunities.